New York has become the first state to enact a ban against fracking despite sitting on rich natural gas deposits, a decision that goes against the energy orthodoxy of the rest of the United States. New York Gov. Andrew Cuomo announced the ban on Wednesday, which will prohibit fracking for natural gas. The governor cited unresolved health concerns and questionable economic benefits as reasons for the measure. During a state cabinet meeting, Cuomo said he would defer to his environmental and health commissioners to recommend a ban on fracking. The state has had a moratorium on shale gas development since 2008 as it underwent an environmental review. Both commissioners concluded that shale development carried unacceptable risks that haven’t been sufficiently studied. “I cannot support high volume hydraulic fracturing in the great state of New York,” said Howard Zucker, acting New York State Health Commissioner. He equated fracking to second-hand smoke, the health risks of which were not fully understood until many years of scientific study were conducted. Environmental Conservation Commissioner Joe Martens said there are a number of reasons that make fracking less economically beneficial than had been anticipated, including the low price of gas and the high local cost of industry oversight. Additionally, large areas would be off-limits to shale gas development because of setback requirements, water supply protections and local prohibitions. The Department of Environmental Conservation will issue a final environmental impact statement early next year. After that, the agency is expected to issue an order prohibiting fracking. The Marcellus Shale – a rock formation that sits under New York, Ohio, Pennsylvania and West Virginia – contains large natural gas deposits of interest to oil and gas companies. The method for releasing the gas involves drilling vertically and then horizontally blasting the rock apart to release the gas using chemically treated water at high pressure. The fracking method has yielded tens of billions of dollars of profits for oil and gas companies, and turned the US into an energy supplier rather than an importer. However the methods used have led to national protests and complaints over air and water pollution, increased earthquakes, property devaluation and health impacts. In New York, the governor faced opposition groups who worked tirelessly to lobby against fracking. Activists worried about the potential effect on the state’s watershed and the aquifers that supply New York City’s water, as well the potential impact on tourism and the quality of life in small upstate communities. Before Cuomo’s announcement, dozens of towns and cities had enacted bans against fracking within city limits, which had implications for waste disposal for fracking operations. There were also maintenance concerns for rural roads that would be used for increased trucking. The governor also faced the oil and gas industry, which lobbied to support fracking in the state. After Wednesday’s announcement, the industry said Cuomo had acted irresponsibly and threatened the state’s economy. "...Governor Cuomo shows that New York families, teachers, roads and good-paying jobs have lost out to political gamesmanship. This is the wrong direction for New York," API New York State Petroleum Council Executive Director Karen Moreau said in a statement. "Robust regulations exist at the federal and state levels nationwide for natural gas development and environmental protection," she added. "A politically motivated and equally misinformed ban on a proven technology used for over 60 years - throughout the country to great success - is short-sighted and reckless, particularly when New York depends on safely produced natural gas just over the border in Pennsylvania." 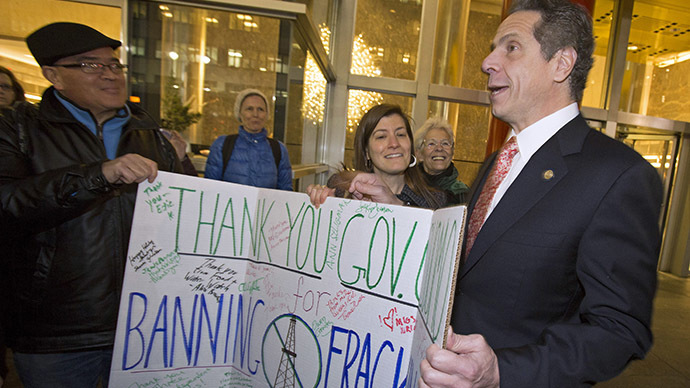 Following the decision, activists involved in petitioning for a ban on fracking rallied outside the governor’s midtown office in New York to celebrate the victory. Against chants of “Thank you Governor Cuomo for protecting our health, our water, our air,” Alex Beauchamp, the northeast regional director for Food and Water Watch, said he didn’t expect it but he thinks it is fantastic news. Also attending the rally was Al Appleton, the former New York City Commissioner for Environmental Protection, who is now an international environmental consultant on sustainability and technical consultant to a number anti-fracking groups. “New York State is undertaking a major challenge. It is not part of the American orthodoxy that you can [move] forward without promoting fossil fuel, so the challenge for New York state is to prove that green energy is not the fuel of the future but the fuel of the present. Appleton said the interesting thing about the environmental movement was there was a lot of people power but also an enormous amount of technical and intellectual power involved.